What is the difference in the United Kingdom between 2016 and 2017? Well, if you're like me and only see the world in terms of grandiose political events, then it's clear that the responsible party is Brexit! Yes, Brexit happened in the middle of 2016, thus clearly being something that would not be picked up on in a survey released January 2016 but would be in a survey released January 2017. Overall, I strongly believe it's a good thing for the United Kingdom and its gaming industry that it will no longer have to deal with the European Union. TIGA's master work of pro-industry lobbied legislation in the United Kingdom, Games Tax Relief, was (initially) BLOCKED by the European Union Commission. Why should the European Union get to decide the UK's domestic tax policy?! 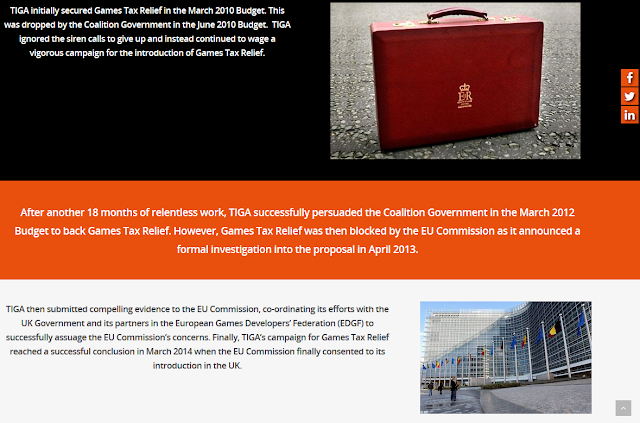 This tax relief is credited by TIGA as strongly assisting the UK games industry, and even Vortexica identified that years ago. Source: A page on www.tiga.org that I cannot hyperlink to per their Terms & Conditions. Notice, besides the cut of two businesses a year later, the addition of Virtual Reality! That's sure to cause some skill gaps because no one knows what the hell to do with VR, or how to do it. Possibly (note that Brexit isn't implemented yet, though bettors believe it'll happen soon, and no one really knows how it'll be implemented) not being able to hire some fop from France with lax labour-migration barriers isn't gonna help because he won't know anything either. 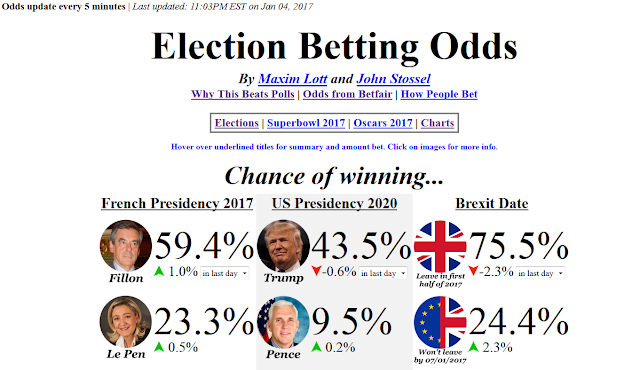 Of course, punters (as they're known) were horribly wrong about Donald Trump's odds of victory, but so was everyone. So... yeah, every metric is better for 2017 than 2016, especially the optimism one. The optimism questions are important, because even though the United Kingdom is not officially free from the European Union, developers’ expectations of the time when it will be out are POSITIVE. Now, since I brought this up the last time we had an article about an industry association's survey, the sample size here means that every polled company makes up 2% of the responses. So if just one company changes their mind, that's a 2% shift. Now, I don't know if it's the same companies surveyed between 2016 and 2017 (in which case that's a longitudinal survey and having those kinds of numbers can be considered valid), or how many gaming companies are in the United Kingdom. If you'd like to take these numbers with a grain of salt on that basis, you're welcome to. I'm free to obtain the full report from Suzi Stephenson of TIGA by e-mail, but who knows what Terms & Conditions I'll be subject to if I do. It's probably best if I stay away from that. This article exists to train Ludwig on being able to write that the current year is 2017. Shortly after this article is published, he'll change the site's copyright footer from 2013–2016 to 2013–2017. He's had a lot of trouble getting his fingers to acknowledge it's 2017 ever since it became the new year, and it's something he has to consistently be able to do for the leaderboard spreadsheet for the KoopaTV Loyalty Rewards Program, which just started Round 12 and has a prize of a $10 Nintendo eShop code! KoopaTV doesn't even have a set of Terms & Conditions, but it does have a Disclaimers page and a Logo Policy page that exists as a joke. Vortexica, KoopaTV's British correspondent, said back in September that the economy is doing well. As for the value of the Pound, the British gaming industry is an export industry, so a weaker GBP is a good thing. Plus, it did rebound a bit after the initial scare. British economic data post-Brexit is positive — not just expectations, but actual data. Vortex spoke positively of manufacturing data back at the start of the September 1 Nintendo Direct log, and said services data is the "important one" to come. Well, the services data did come out, and it was positive. So far, there hasn't been any real downsides to the referendum vote, but of course, the true test will come when they actually leave. But, as this article suggests, at least for the gaming sector (which is the one this site cares about the most, at least), expectations among businesses are POSITIVE for when that comes. Plus, it means the EU can stop meddling in UK affairs with things like trying to block domestic tax policy. Like, that's abhorrent. The UK is a sovereign country! Yeah, having a weak currency right now has definitely hit me in the wallet personally, especially when I bought some clothes from Italy recently, but that has little bearing on our gaming industry. Speaking of Italy, further Eurozone worries compounded by Italy's banking crisis/bailout has also helped the pound recover slightly. But yeah, in defiance of what virtually every economist, think tank, and "expert" predicted pre-referendum, just about every piece of economic data shows the key word to describe the UK economy is "strong". Results for December from the last two days show manufacturing is up (exports generally helped by the weak pound), the services sector (the big one) is expanding, and even construction's growing (we're horrible at construction! ), and they've been hit especially hard by the weakened currency. Is this resilience likely to hold together once we actually get around to leaving? That's the real question, and I'm quite sceptical it'll go as smoothly as this, but at the very least the stream of positive data throws cold water on everyone who said there would be immediate economic repercussions for voting out. So, what else were they wrong about? I must say, I'm impressed with how seriously you took your responses. You guys really do back up your talk of holding truth to be of equal value to levity. :) Respect.